Priest Blu-ray Review. In the end, an interesting mythos and some great visual effects aren’t enough to lift Priest above ‘mediocre’ status. The poor execution, the lack of a killer script and characters that are hard to care about ultimately sour the deal. ‘To go against the church is to go against God.’ That’s the mantra that we’re subjected to, over and over, during the first quarter of Priest’s running time. This is a dark industrial world, ruled by an autocratic religious government who work their subjects to the bone. 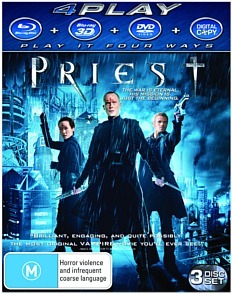 The Priest (Paul Bettany) was once a warrior for the all-powerful church, but he has been retired thanks to the defeat of their enemies, the vampires. Those that still exist have been driven into internment camps, far out of harm’s way. Most of the human population survives inside giant walled cities, where their lives are tightly controlled by the church. But the church doesn’t count on their retired Priest picking up his old weapons when he suspects that the people are being misled. Responding to a plea for help, he leaves the city for the wild frontier, where settlements are scattered across a bleak arid landscape. Aided by local Sheriff Hicks (Cam Gigandet), Priest does some digging ands finds out that his niece has been kidnapped by vampires and imprisoned on their armoured train. While he is searching for her, the church has sent out its own agents to stop him finding out the truth. As a visual spectacle, Priest is quite impressive. The weapons, vehicles and locations are all rich in detail. The setting is dark industrial-meets-western-steam punk, with many different elements going into the mix. The makers of Priest have done an excellent job at creating a stylised futuristic environment, which is for the most part believable. The fight scenes have a strong comic book feel to them, and are all excellently choreographed. Unfortunately, the production falls down in a few areas. The transitions between scenes are very jarring, and it often feels like we’ve been dumped into a new story arc or location with little context. At the end of most scenes the music builds to a crescendo, which completely overpowers what’s happening on screen and seems excessive. And for the most part, the dialogue is colourless and flavourless. Paul Bettany and Maggie Q get a pass for their performances, but the other actors struggle to find their rhythm with the material they’re given. Priest is a varied and interesting visual journey, with both deep shadows and bright desert exteriors. The animated into sequence is well designed, a tip of the hat to Priest’s graphic novel origins. As previously said the musical score can be overpowering, but there also some great atmospheric sounds in the mix: wind, engines, explosions, etc. The 3D effects are showcased in several scenes, such as when Priest’s bike travels under a rocky pillar or when he hurls throwing stars into the air. Bullets and crucifixes: This is basically an audio commentary, using picture-in-picture rather than a simple voice-over. Commentary: Director Scott Stewart, Writer Cory Goodman and stars Paul Bettany and Maggie Q add their thoughts on the production. Deleted and extended scenes: Most of these were omitted with good reason, but the extended ending is worthwhile. The bloody Frontier: The pick of the special features, this one talks about the creation of the unique world and characters. Tools of the trade: The crew take us through some of the highly impressive props used in the movie. In the end, an interesting mythos and some great visual effects aren’t enough to lift Priest above ‘mediocre’ status. The poor execution, the lack of a killer script and characters that are hard to care about ultimately sour the deal.